Announcing Posh house estate works, llc! We are transitioning from Things You Love Events, LLC, to Posh House Estate Works, LLC. We will be operating under the Posh House, DBA. It is time - Anthony and I have been building our business over the past three years, and it obviously needed a re-vamp in name and brand. We have a method of operation that exceeds others in this business. The relief felt by our clients when we explain what we can do for them is palpable. We alleviate the stress and overwhelming process of emptying a home, regardless of the reason. It’s about focusing on the future, and leaving everything else behind. In our capable hands, all unwanted possessions are redistributed in the client’s best interests, and the house is cleared and ready for a new start. Watch for a new website, sign up for news about our exciting sales this Spring, and adhere to our number-one piece of advice - Don’t discard or donate anything. Not even to stage the house. Call us first! There is a method for the best final outcome, and it’s what we do! Free consultations are scheduled quickly, so you can begin the process and not make the common mistakes. We offer free viewing of your home and it's contents to assess how best we may meet your needs. We are connected with many dealers, buyers, donation centers and clean-out services that can help facilitate re-housing your unwanted belongings. We specialize in holding sales for you from within the home, utilizing our extensive mailing list and social media outlets to reach your customers. Clearing your home and selling your belongings, for whatever the reason, can be a trying and emotional experience. We help alleviate the stress of a potentially overwhelming process. We set up homes for the contents to be sold from within the home. We make an initial visit to assess the quantity and quality, and the amount of time required to set up. We work with you to fix a date for the sale, which usually takes place on a Friday and Saturday. Our advice, right from the start, DO NOT TRASH OR DONATE ANYTHING! We know what sells, and sometimes it is the inconsequential items that sweeten the deal to help sell the cumbersome or trickier items. So please, leave everything in it's place. Let us help - why do the extra work if we can take care of it for you? It's what we do! A week or two before the agreed sale dates we will prepare your home and contents for a sale. We provide all our own equipment, signage, and take care of the promotion. We have an extensive mailing list/social media following of customers that come to our sales. Our fee for organizing, set up, pricing, staffing, promotion, and holding the sale is 35%. We have a small team of trusted and hardworking people that usually come towards the end of the set up period, and for the days of the sale as additional security and to assist our customers. After the sale we can help you relocate the remaining unsold items - either by donation, or by offering a separate clean out service. 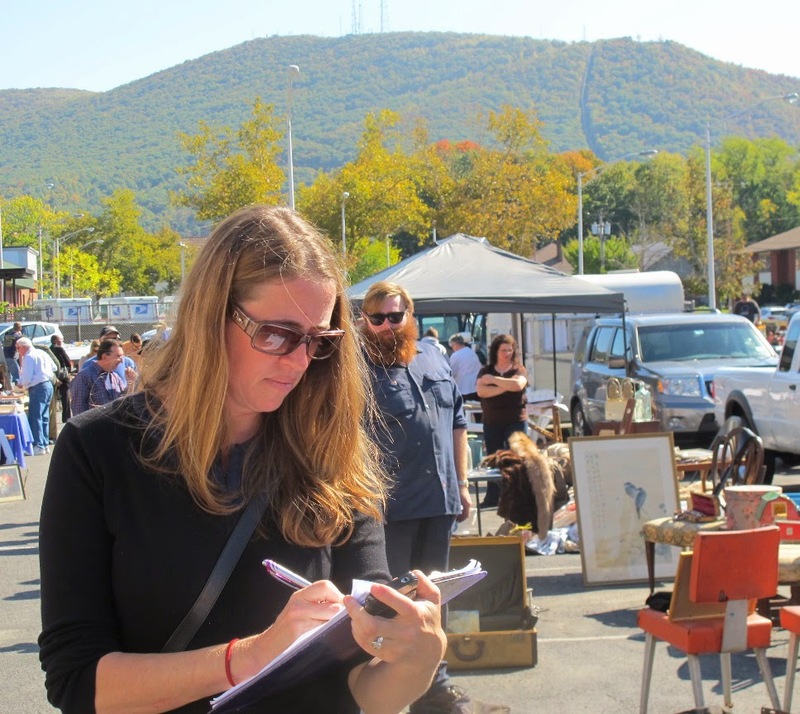 Emma - owner and operator of Beacon Flea Market in Beacon, NY. I watch the trends, and am constantly learning about the history of our area and the beautiful things we choose to bring into our home. Originally from the UK, I worked for an antiques shipping company in NYC, before moving to Beacon with my family. I have built an extensive following of customers through social media, and cross-promote sales with the flea market followers. Anthony - Co-promotor of the Beacon Flea Market, NY. A full time dealer buying, selling and appraising 20th Century design and fine art. A staple on the show circuit since 1992 at The Pier Show, Modern Show at the Armory, Brimfield and 26th St, NYC. Anthony completed the NYU Comprehensive Appraisal Studies Program. I am so lucky a friend referred me to Emma and Anthony when I was frantically trying to move out of my house of 30 years which had just sold very quickly. Emma and Anthony were a joy to work with! All I had to do was take any items out of cupboards, cabinets and closets, that I wanted to keep. They were brilliant at turning my house into an antique store, and they are very well-versed in estimating values. They handled all aspects of the sale and even coordinated the complete clean out of the house. Parting with my house and many of the things inside was emotionally hard - they made it incredibly bearable! Becky, Hopewell. "Our family was very pleased with having this company run the estate sale at my parents' home in Beacon. They did a fantastic job on organizing, pricing and staging. It was great to have them take care of all the details with much respect. Thank you." Angie B. "My husband and I recently engaged this Beacon company, since we were moving out of state and wanted to sell many things that we weren't taking to our new home. It was a tough moving sale, as we were still living in our house while the moving sale was being organized. So - to say our house was chaotic is an understatement. I never saw people work harder in my life. They were in my house for days, organizing, putting up tables, pricing, researching. They were fabulous and I really enjoyed having them in our home. Emma does the advertising, signage, emailing - everything to make people aware of your sale. They know the value of your belongings and price them to sell, but they don't give away the store! Not only did we make money from the sale of our belongings, they also offer an optional service where they take away almost every single item that did NOT sell. We took back a few things that we decided to keep after all, but the benefit of having our house cleared of all the things we were not taking with us was indescribable. I just spoke to someone who paid thousands of dollars to have his late mother's belongings cleared out of her house. Knowing that we are spared trips to the Dump, trips to Goodwill, waiting for pickups from other charities - it's all done and they did it! I highly recommend them. They made a very stressful time so much easier. Thank you!" "I had the good fortune to visit an estate sale run by these folks. 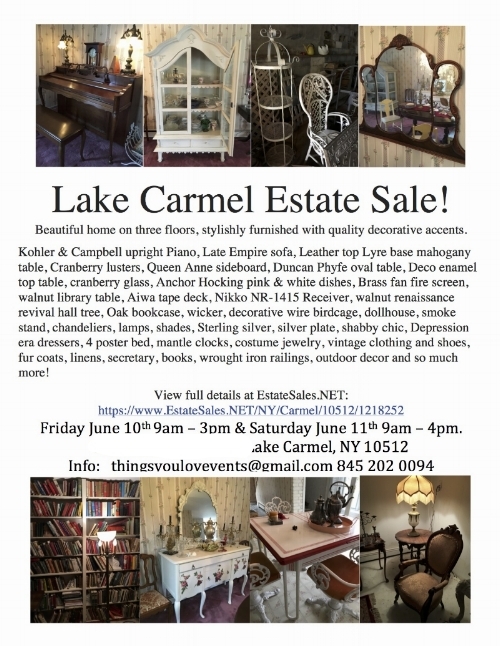 It was run professionally, super organized, great bargains, and compassionate for both the seller and the purchasers. Great experience, superb business." "What a miserable weekend to have an estate sale! Your advertising and pricing made it a success! Thank you for all your hard work!" Enjoy the before and after pics from the Carmel house earlier this year. Not all houses take this long to clear - usually we are done within a week. But this house was special, and we loved carefully unpacking and staging everything, selling and re-housing so much, until really only left with what had to be cleared into a dumpster. Finally the house was cleared, cleaned, and ready to be listed. The company that handled this last stage are amazing, and we are very happy to recommend them. Feel free to contact us for more information. The transition from the initial walk through, the unearthing of furniture from beneath piles of boxed smalls, to the cleaned floors and bare walls is amazing, and deeply satisfying, as you can see.